Alberta, Canada, circa 1905. 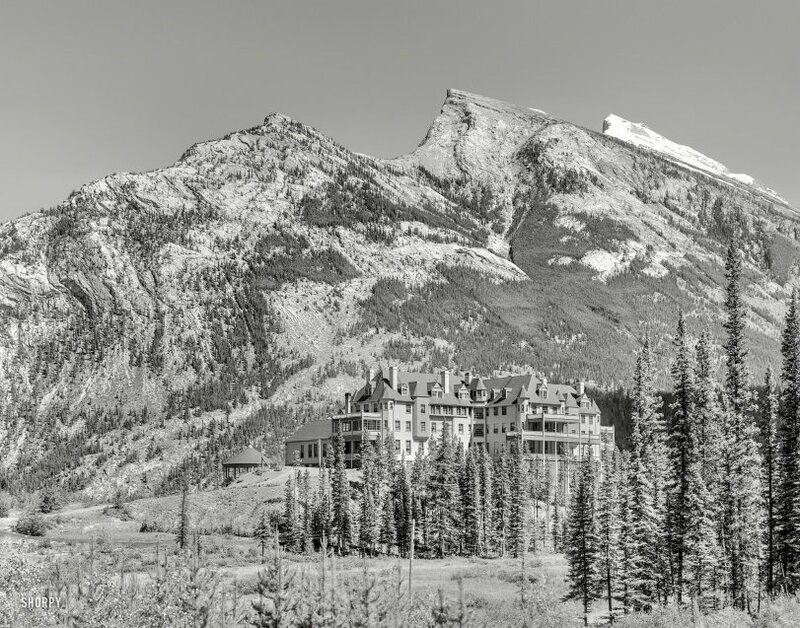 "Mount Rundle and the Banff Springs Hotel." Nineteenth-century Canadian Pacific Railway resort that gradually morphed into the vast stone edifice rising above Bow Falls today. View full size. Submitted by tedturner on Thu, 07/10/2014 - 6:31am. I've been there in real life, but it was around 95 years after this picture was taken. Submitted by BarryR on Wed, 07/09/2014 - 7:29pm. It does rather remind me of a certain Overlook Hotel. Submitted by HAC on Wed, 07/09/2014 - 6:00pm. But that allowed them to put it facing right way round when they rebuilt it in stone. Great place to stay, wonderful example of CPR Gothic style, wonderful views from the terrace of the Bow River (and the Falls). In the front courtyard there's a statue of Van Horne pointing at the mountains, supposedly pointing out where he wanted the hotel, but we long term CPR employees always figured it was his "Hey, you, I see you, get back to work!" pose. Submitted by Ice gang on Wed, 07/09/2014 - 2:36pm. the same year Alberta became a Province of Canada.